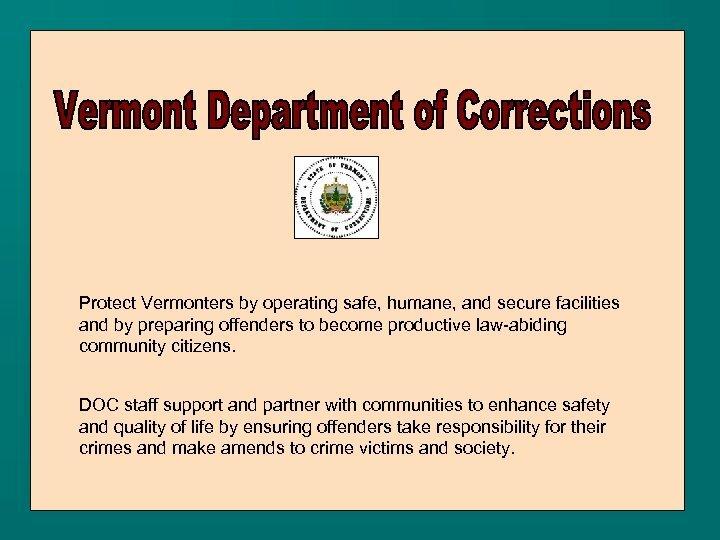 Protect Vermonters by operating safe, humane, and secure facilities and by preparing offenders to become productive law-abiding community citizens. 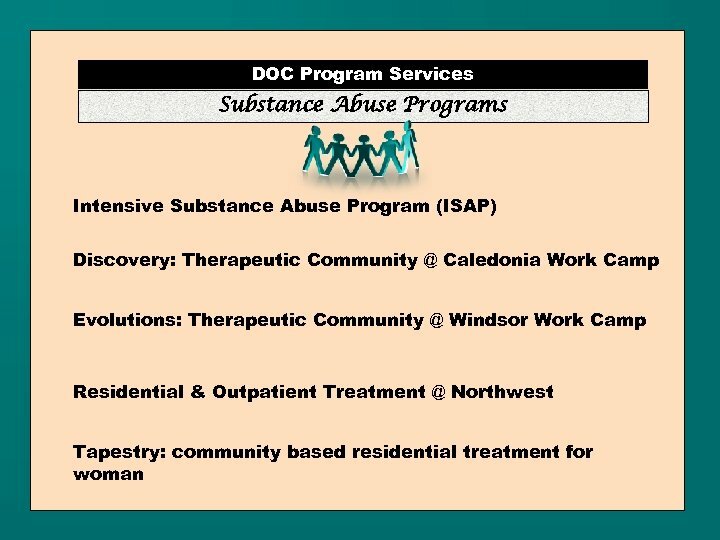 DOC staff support and partner with communities to enhance safety and quality of life by ensuring offenders take responsibility for their crimes and make amends to crime victims and society. 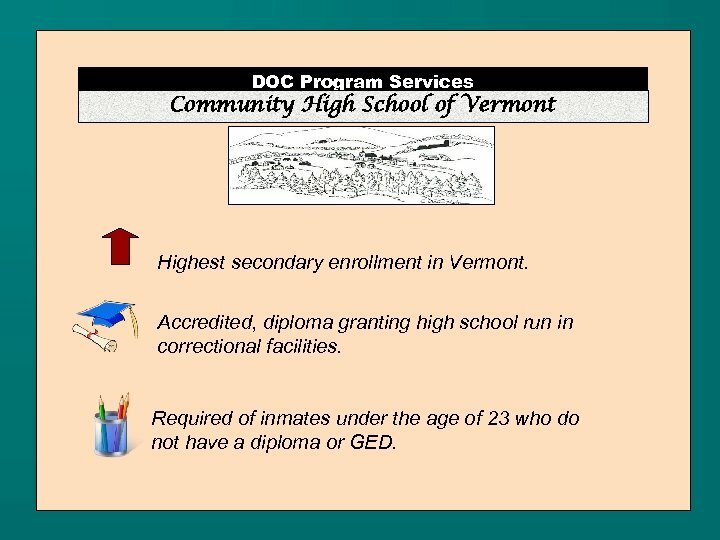 DOC Program Services Community High School of Vermont Highest secondary enrollment in Vermont. Accredited, diploma granting high school run in correctional facilities. 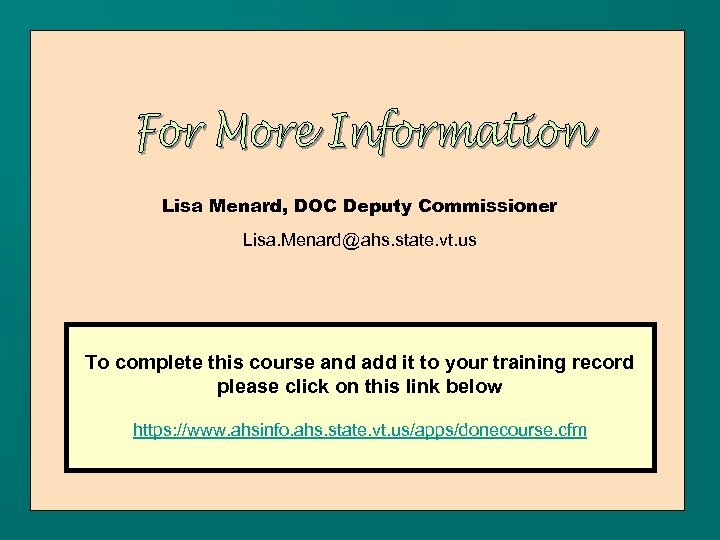 Required of inmates under the age of 23 who do not have a diploma or GED. 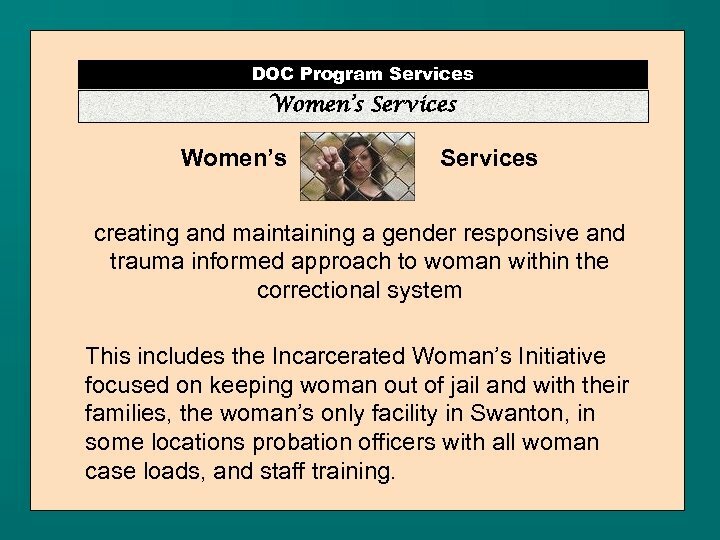 DOC Program Services Women’s Services creating and maintaining a gender responsive and trauma informed approach to woman within the correctional system This includes the Incarcerated Woman’s Initiative focused on keeping woman out of jail and with their families, the woman’s only facility in Swanton, in some locations probation officers with all woman case loads, and staff training. 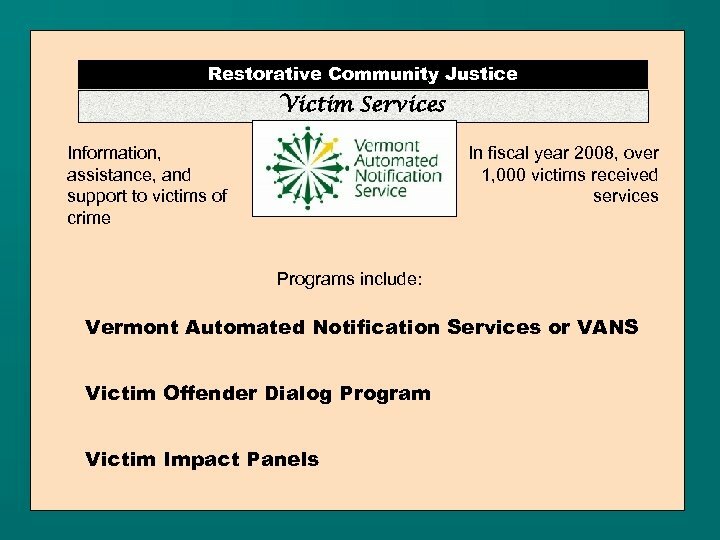 DOC Program Services Vermont Treatment Program for Sexual Abusers a nationally acclaimed program that uses contracted licensed therapists to teach offenders how to accept, understand, modify and maintain permanent changes in behavior relating to illegal sexual behavior. 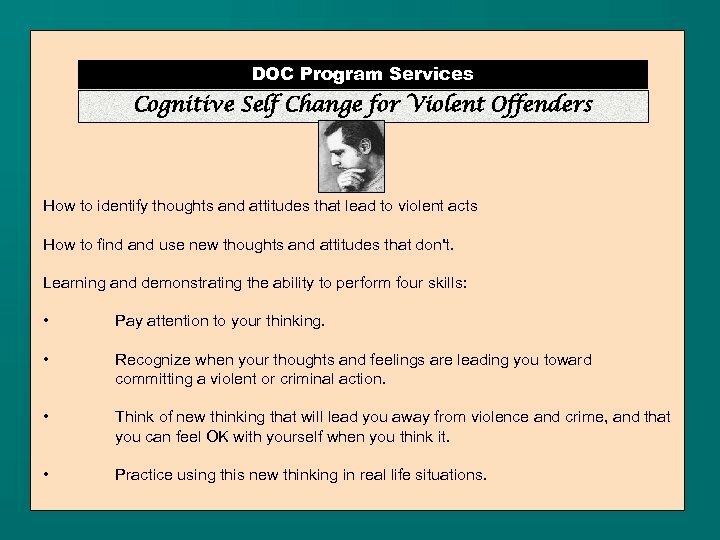 DOC Program Services Cognitive Self Change for Violent Offenders How to identify thoughts and attitudes that lead to violent acts How to find and use new thoughts and attitudes that don't. Learning and demonstrating the ability to perform four skills: • Pay attention to your thinking. • Recognize when your thoughts and feelings are leading you toward committing a violent or criminal action. • Think of new thinking that will lead you away from violence and crime, and that you can feel OK with yourself when you think it. • Practice using this new thinking in real life situations. 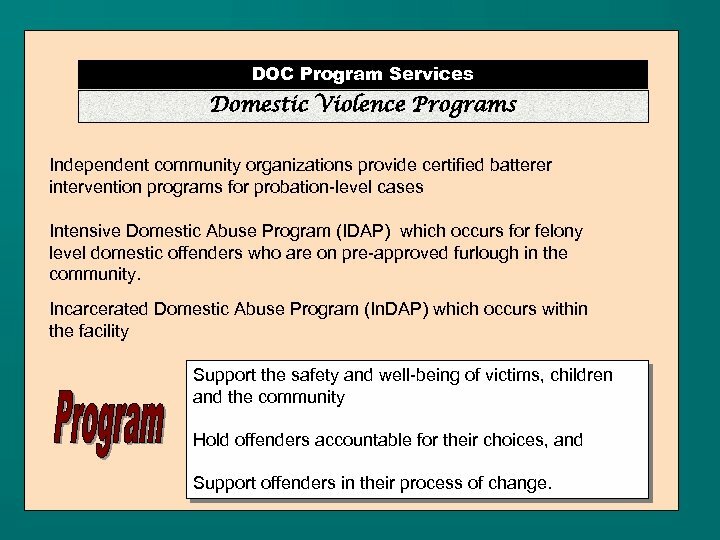 DOC Program Services Domestic Violence Programs Independent community organizations provide certified batterer intervention programs for probation-level cases Intensive Domestic Abuse Program (IDAP) which occurs for felony level domestic offenders who are on pre-approved furlough in the community. 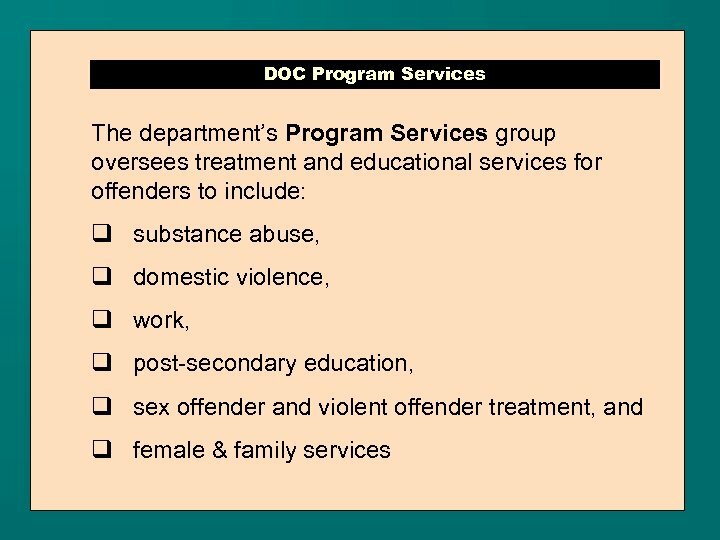 Incarcerated Domestic Abuse Program (In. 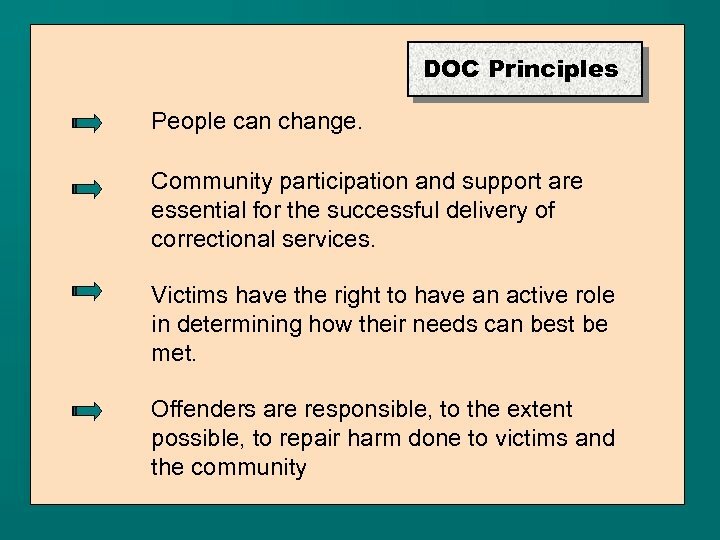 DAP) which occurs within the facility Support the safety and well-being of victims, children and the community Hold offenders accountable for their choices, and Support offenders in their process of change. 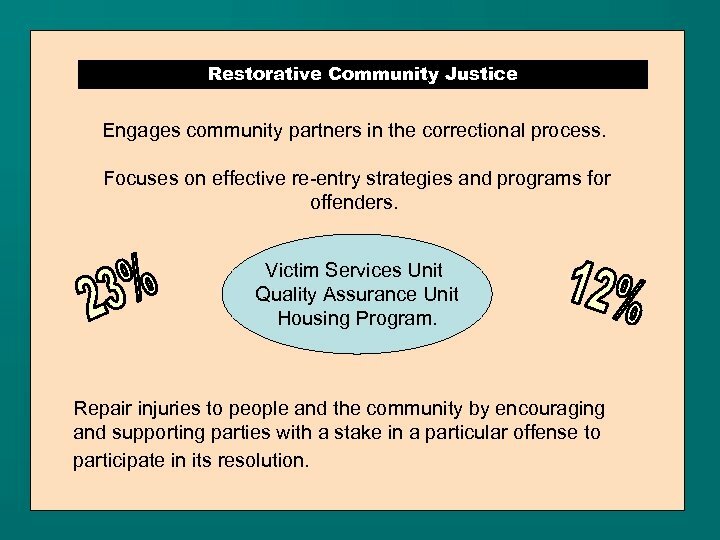 Restorative Community Justice Engages community partners in the correctional process. 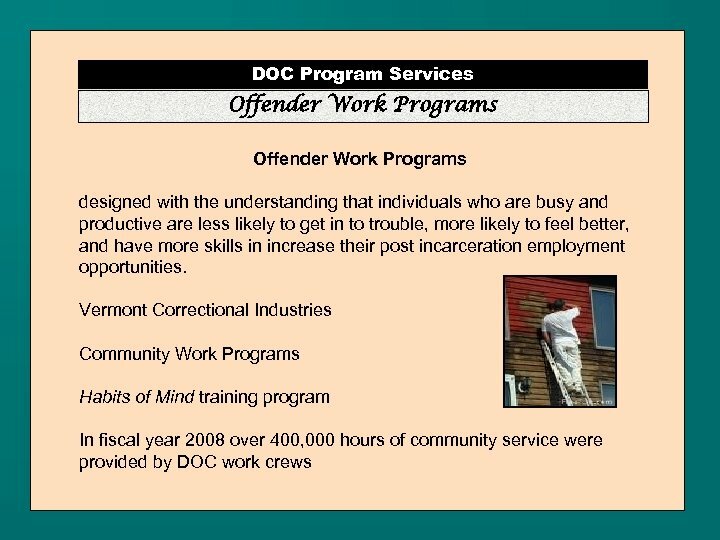 Focuses on effective re-entry strategies and programs for offenders. 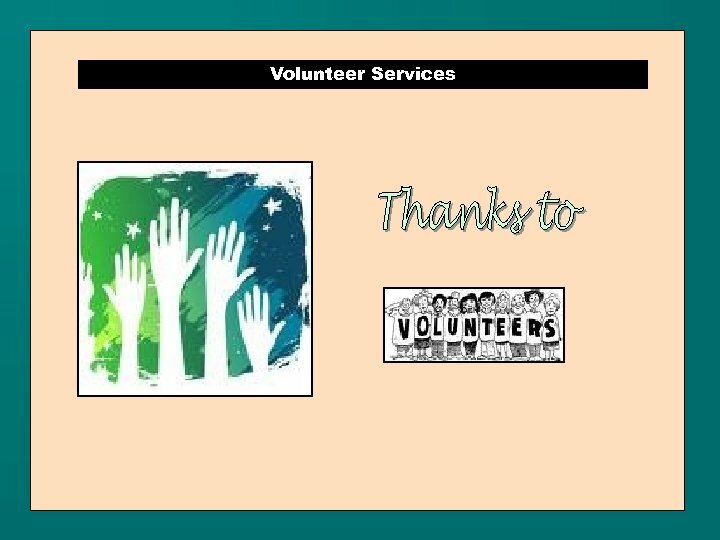 Victim Services Unit Quality Assurance Unit Housing Program. Repair injuries to people and the community by encouraging and supporting parties with a stake in a particular offense to participate in its resolution. 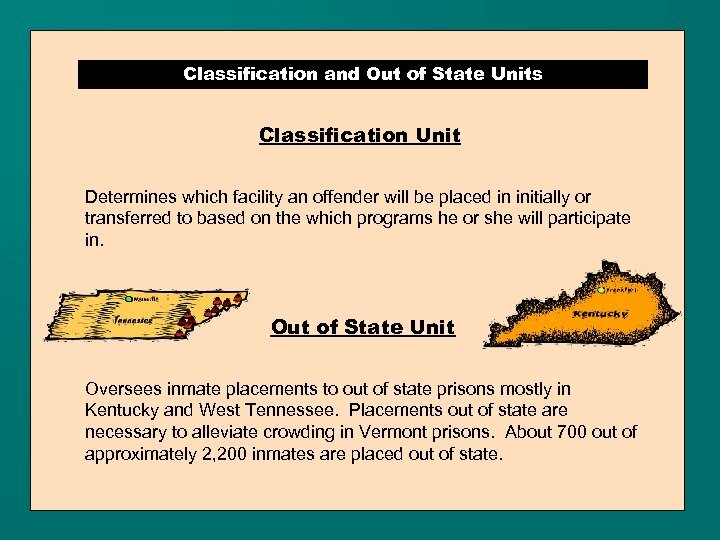 Classification and Out of State Units Classification Unit Determines which facility an offender will be placed in initially or transferred to based on the which programs he or she will participate in. Out of State Unit Oversees inmate placements to out of state prisons mostly in Kentucky and West Tennessee. 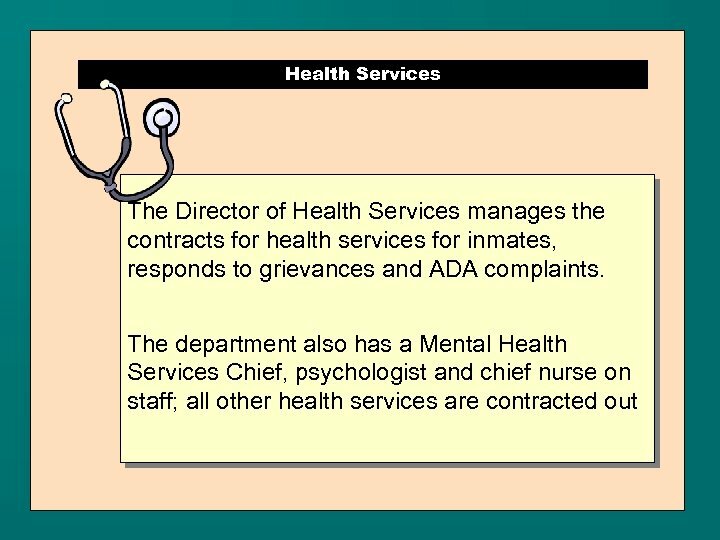 Placements out of state are necessary to alleviate crowding in Vermont prisons. 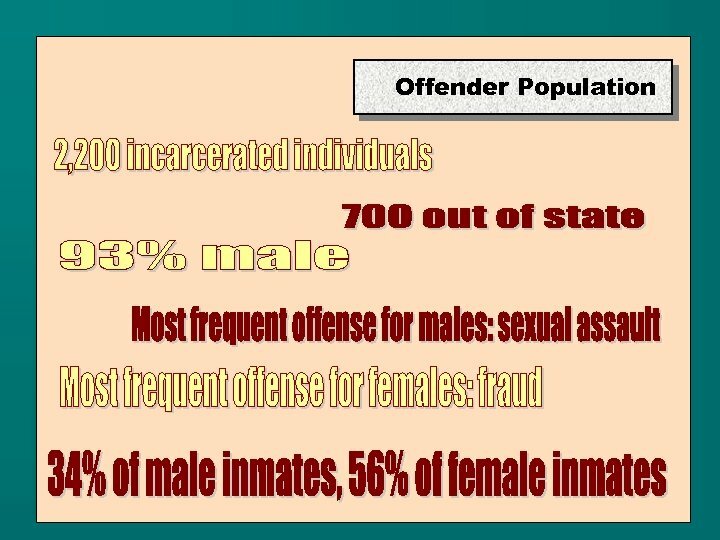 About 700 out of approximately 2, 200 inmates are placed out of state.